Android Design Support Library makes us easy to make android application by providing numbers of material design components. There are many material design components including Floating Action Button (FAB), Snackbar, Navigation Drawer, Tabs, etc. which can easily be implemented to our application with little bit code. In this tutorial, you will learn to implement material design tabs using tablayout and design support library in your android app. TabLayout also have many more attributes and which are very important. Here I have used toolbar and some other design support library components. Let’s start by creating new android project and give the project name Material Tabs Using TabLayout in Android. Open your app colors.xml file and add the below XML color values. Open styles.xml file and add the below content. Now modify your XML layout file. Here I have added DrawerLayout, CoordinatorLayout, Toolbar, AppBarLayout, TabLayout, etc. Simply you can copy and paste the below content to your XML layout file. This time is to work with java code. Open your app java activity file and just add the following code in your java activity file. That’s all. 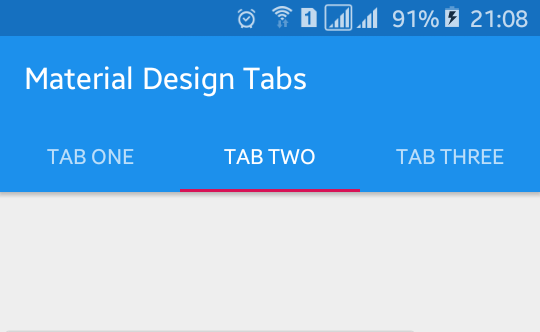 Run your Android Material Design Tabs Using TabLayout application, which will look like the above screenshoot.